The mornings always begin early with a wake up calls followed by breakfast. The Elephants are dressed with their various paraphernalia consisting of ropes, mattresses made of grass and cotton, saddle seats made of wood – it is quite a cumbersome process, achieved only if there is full cooperation from the Elephant- but an enjoyable experience for the tourist. A back up Jeep with the guests luggage, bottled & aerated water, tea & coffee, umbrellas, extra cushions, medicine & first aid kit, etc is always behind the Elephants, not visible or heard by the guests, but only a whistle away – just in case anything is required in an emergency Lunch sites are pre-planned, with a table and chairs set on the banks of a river or stream and the Chef is waiting to whet your appetite with his culinary talents. The food served during the safari is vegetarian and freshly cooked in full view of the guests – a great opportunity to learn Indian cooking. The accompanying Naturalist walks along the Elephants during the Safari and enjoys pointing out the flora, fauna and various other interesting facts like pug marks, claw markings etc. The jungle information is passed on slowly during the interaction with the guests, related to their field of interest. The days are full of activity and sightings of wild animals & birds in the jungle add to the experience. Once we reach the forest rest houses used for the night halts – we make sure the Elephants are comfortable with lots of fodder and sugarcane, which is carried by a separate jeep and trailer. 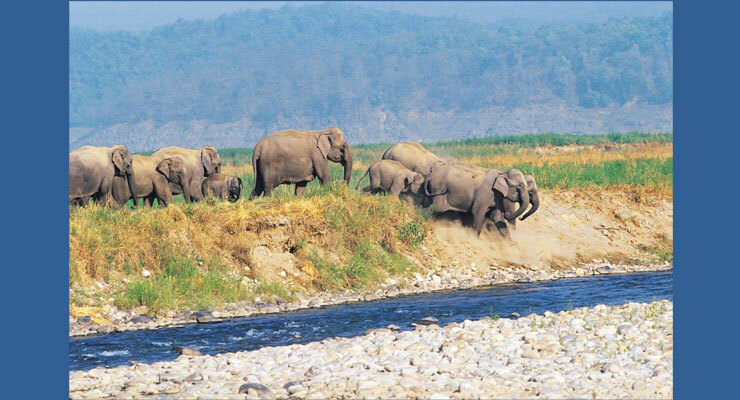 An Elephant safari is a well planned and time-bound operation, which we foresee and plan to the minutest detail – you have to experience it to believe us. You would be surprised if we told you that for two guests who go for an Elephant Safari- there are 8 staff who are fully involved in the operation. The Elephant driver and his helper, two Jeep drivers, the Chef, and his helper, the housekeeper who doubles up for service and the Naturalist. Distinguishing Marks: Depigmentation marks on forehead. Characteristics: Champa rani is named after a fragrant Indian flower – she is a delightful lady, very docile, friendly and well behaved, with small but expressive eyes. Anyone can walk up to her and stroke her on the trunk without any fear. She is a fast walker, has a very keen sense of hearing and will always try and inspect and see what created the sound – this helps her mahout to locate small mammals in the forest. She used to work in a circus earlier so knows a few tricks and these she loves to show off around the evening campfires – in lieu of her sugar treats. Distinguishing Marks: Depigmentation marks below the neck and scattered marks on forehead. Characteristics: Chanchal means timid- she is very calm and tolerant, though she has a bigger head structure and bolder appearance. She is very well trained and has an uncanny sense of smell- this gives her the capability of seeking out scent trails left by wild animals, especially the cat family and she communicates this out to her mahout. The language of expression is an understanding and bond between the two difficult to explain in words but easy to comprehend when experienced.